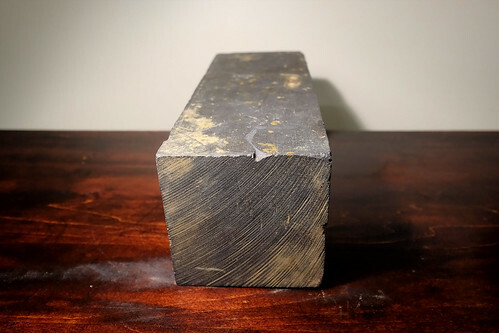 An original graphite brick from the Chicago Pile reactor supply. 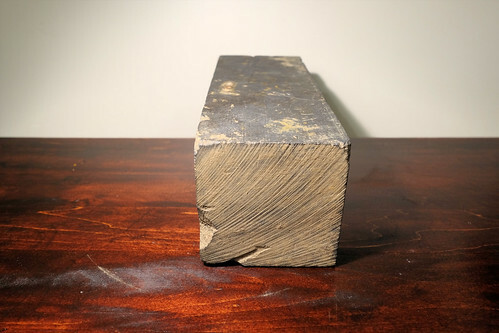 This historic artifact is an original graphite brick from the reserve supply that was used to construct the Chicago Piles (CP-1, CP-2, and CP-3) which were one of the most important milestones of the Manhattan Project. Unlike a piece owned by Carl Willis, this piece was a moderator unit and did not contain uranium slugs. This is one of the non-radioactive artifacts in my collection with no detectable alpha, beta or gamma radiation. The physical size of this specimen in inches is 12 x 4.5 x 4.5 and the total weight is 4,400 grams. It is nearly impossible for me to put a value to such an important and unique piece of nuclear history. 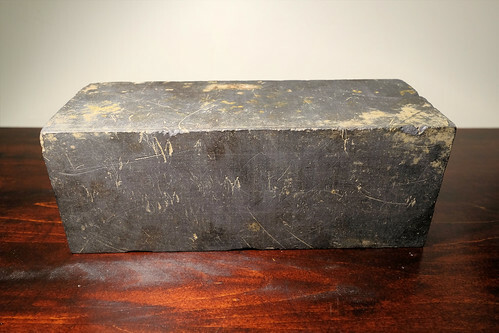 In all of my years of collecting I have never seen another graphite block from any of the Chicago Piles for sale. I would love to hear from you if you also own a piece of the CP-1, CP-2, or CP-3 reactor piles. The CP-1, CP-2 and CP-3 piles were a 24′ wide, 24′ long and 19′ high stacked pile of machined graphite blocks and uranium slugs erected on a wooden frame. The blocks loaded with uranium slugs were placed in alternate layers of graphite separated by solid graphite blocks to form what is called a lattice structure. The CP-1 reactor pile contained 385.5 tons of graphite (771,000 pounds) and 46.5 tons of uranium metal and oxides (80,590 pounds of uranium oxide and 12,400 pounds of uranium metal) produced by Mallinckrodt Chemical Works in St. Louis, Missouri. The graphite blocks had to be cut exactly to fit snugly together. Some blocks had holes drilled in them to fit lumps of uranium inside. 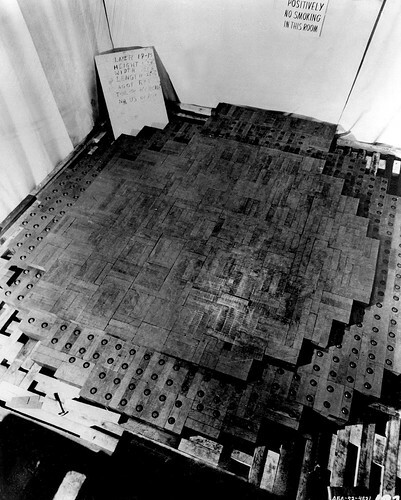 Other blocks had holes drilled through them to fit 14-foot control rods made out of cadmium which were used to control the neutron multiplication in the reactor pile. A “live” graphite block from the CP-1 reactor pile complete with uranium fuel slugs owned by Carl Willis. Be sure to read the Chicago Piles section of this website for more information about the Manhattan Project reactor piles.